I would definitely recommend this product. I looked all over the web to find a mirror this size. The best thing was the numerous selections of sizes. This size mirror is not easy to find anywhere else...not even in stores. And...the Overstock website was convenient and easy to navigate. Product arrived on time..which was a bonus ! 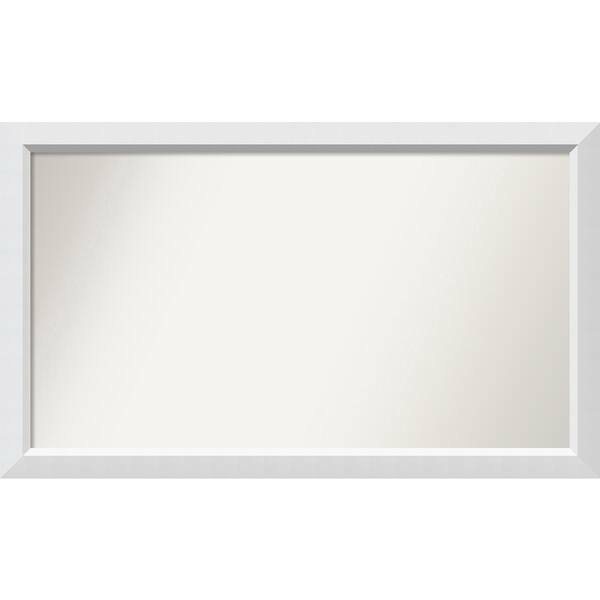 This mirror features a geometric white frame with a flat face and angled inner edge. Its clean lines and neutral tone will complement your contemporary decor. Dimensions 35.0 In. X 1.0 In. X 33.0 In. Nice custom size mirror. First order arrived with damage/paint missing on one corner of frame. Very well packaged, must have been damaged before shipping. Also corners were not well aligned. Considering the cost I requested a replacement and was shipped a much better unit. Overall pretty satisfied despite waiting for no hassle replacement. Matched new cabinets very well. Best price for large mirror. Good quality and wasy to hang. The fact that there are so many sizes available makes it a great go to for a clean, right sized look. Arrived in timely manner. Very well, securely packaged. Quality mirror. I hung over vanity sink - quite heavy. 3rd mirror purchased from Overstock- all were quality products and securely packaged. I recommend this item. I am remodeling my bathroom and needed to find the perfect mirror. It arrived flawless and looks amazing in my new bathroom. I get compliments all the time on this mirror. Very clean design, high quality glass, easy to install, bought it eighteen months ago, yet it looks brand new. I'm leaving this review because I am buying two more just like this one. Beautiful piece, clean and simple. Great quality of you and value for the style. "Is the mirror tempered safety glass. What is weight of 42" x 36" mirror." "How does it hang? What is the mounting hardware? Is it flush or is there a gap between the mirror and wall?" There is a hanging wire across the back so it can be hung horizontally or vertical. There is a slight gap between wall and mirror. 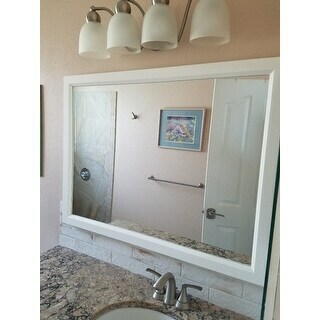 "I need a 42'' long mirror to hang over vanity"